These days, it’s hard not to wonder what our future world would look like— and it’s even more likely to imagine it to be dystopian. And with the influx of growing A.I., automatons and otherworldly technology, who’s doubting that robots will be a bigger part of society? Certainly not me, and perhaps for the best, certainly not the plethora of animators behind the crazy-good anthology series, Love, Death & Robots. 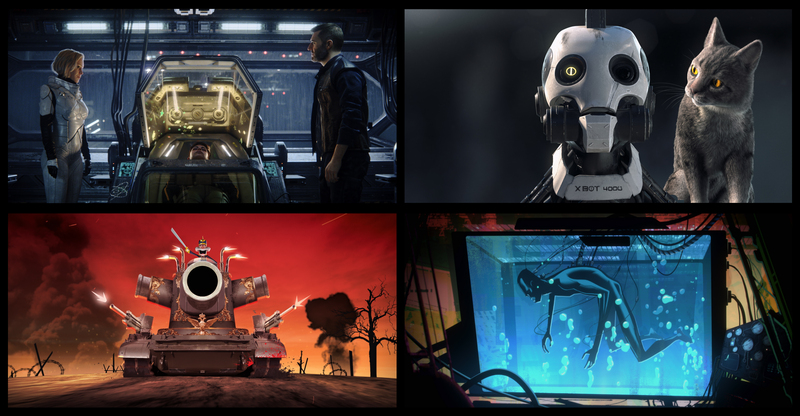 Love, Death & Robots is a collection of animated shorts that range from comedy, horror, sci-fi, fantasy to drama, and each in their short runtime depict a different storyline that involves robots, love, death or all three, along with other monstrous creatures like cyborg hunters, robot cage matches, demons, werewolf spiders and more. The animated styles vary from 2D to photo-real 3D CGI as well, and in the more realistic-looking shorts almost had me fooled in thinking there were live actors involved. Presented by Deadpool creator Tim Miller and director David Fincher, each short plunges deeper and deeper into an amazing new vision involving robots and walking machinery. Some are hilarious and captivating like a Pixar short; others are not meant for children and feature some mature content. As of this post, I’m still making my way through the series, and I’m amazed with how far animation has come in this era. It’s the only medium that could truly allow these ideas to play out for an audience, and while some storylines are better than others, I’m all in for animation to be seen less than a kid-friendly genre and worthy of adult consumption by a mainstream audience. There has been a bit of controversy, however, with how the show’s series order is being handled. Apparently Netflix has been experimenting with the way the episode order is presented to every user— some people on Reddit have speculated it could be based on gender or race, but Netflix’s PR assures that it’s purely based on region or length of time. Whatever order you see the series, Love, Death & Robots has no shortage of fantastical elements to hook you in. It’s at least better than any future world you can imagine. Love, Death & Robots is available to stream on Netflix.